Are you considering a kitchen garden in Northumberland or nearby? If you are, it is time for you to visit Cowell’s Garden Centre for the expert suggestions and buy all the gardening essentials you need for your grow-your-own garden. You see, kitchen gardening is no simple business and you need more than just plants to grow a flourishing garden of edibles. Selecting the spot for your kitchen garden is the first and most important step of the process. Make sure your kitchen garden is on the side of the house that gets the most sunlight every day with a small section in the shade so you can also grow vegetables and herbs that prefer these conditions. Your selected portion of the garden must also have great drainage. Keeping it simple in the beginning is a good idea. If you start with plants that need extraordinary care and special conditions, it might dampen your dreams fast. Instead, focus on try a variety of rather easily growing vegetables and herbs. For instance, Asian greens, basil, beans, cucumber, lettuce, parsley, peppers, spinach, tomatoes, etc. Only then should you move on to the tricky ones, like artichoke, cabbage, carrots, melon, onions, rhubarb, etc. Keep your beds raised. 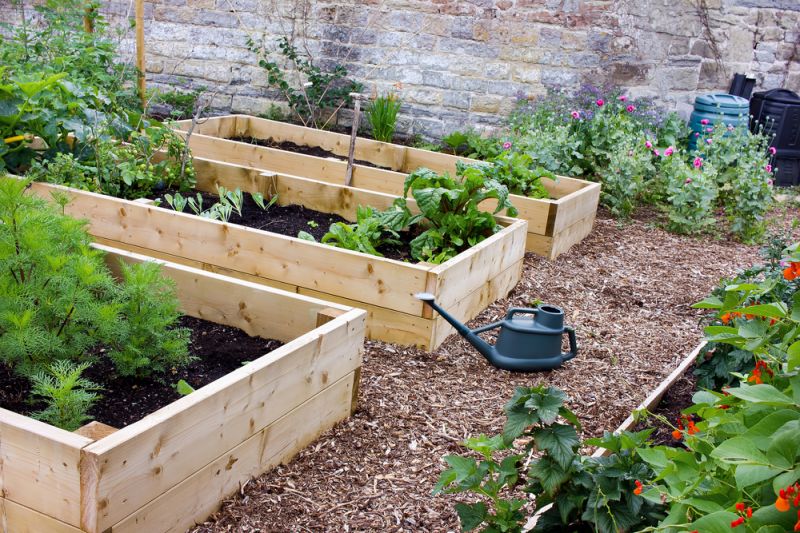 There are many benefits to using raised vegetable beds in your kitchen garden in Northumberland. The greatest advantage is it automatically improves the growth of the plants and gives you more produce, since the roots have more room to grow down to. It also allows you to add good quality topsoil for your vegetables. You also get to avoid backache from bending too often and very few pests make it up to raised beds. Since many gardeners want to grow more and more vegetables, fruits, and herbs once they begin to see their hard work is paying off, it makes sense to use vertical growth with wall planters and railings. A lot of edibles that grow vertically can be grown this way. Such plants include gourds, melons, peas, pole beans, squashes, tomatoes, etc. So, save space and go vertical. Another benefit of using vertical supports and layers is it allows you to space out your plants adequately, which is necessary for healthy crops and bigger yields. So, when you begin working on your grow-your-own garden in Northumberland, you should use simple geometric shapes as your guiding patterns. For example, you can use rows of your plants to make squares with equal distance between every two plants. However, triangular patterns will allow you to sow more plants. Sow your seeds in small pots weeks before you actually plan to put them in your garden soil. This way, you can avoid the setbacks of seeds failing to adapt to your soil, which happens often. At the same time, you can save all the time usually spent in this crucial stage of sprouting. When you reap your current crop, you will already have seedlings ready to go into the soil. When you are growing a kitchen garden in Northumberland, a place where summer is not the longest season of the year, it is prudent to choose vegetables and herbs that grow fast. This way, you can get more yield in shorter periods of time. To save precious space in the beds, you can grow compatible plants together. Incidentally, a lot of popular plants you find in garden all across Britain can be grown as compatible pairs. For example, basil and tomatoes, beans and corn, and beans and spinach. At Cowell’s Garden Centre, we have a great number of plants to satisfy your appetite for kitchen gardening in Northumberland. We have all the plants named in the bullets above and many more, establishing a wide collection of plants fitting for a wonderful grow-your-own garden flourishing right outside your kitchen window. Variety is but one of the benefits you can enjoy when you buy plants for your kitchen garden from Cowell’s Garden Centre. There is also the matter of the quality of the seeds, seedlings, and plants you get for the garden. We grow our plants in the nursery with special care and focus on quality and frequency of yield. We achieve higher results by using high-quality soils, fertilisers, and liquid feed. During your visit to the nursery, you can talk to our experts on the premises. Our sales team is full of avid gardeners who love to grow their own edible plants. Talk to one of them about your plans for the grow-your-own garden in Northumberland and they will help you find the perfect combinations of plants, containers and accessories you may find useful. Their focus is always on delivering value so you can get the best out of your budgets.